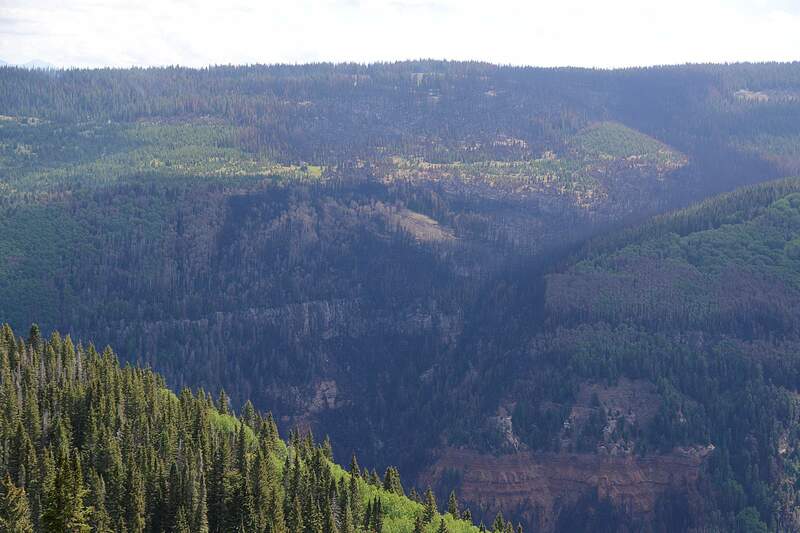 The Burro Fire’s path is visible up a Bear Creek canyon from a fire lookout post on Monday. A log burns Sunday, June 17, in the Burro Fire east of Dolores. 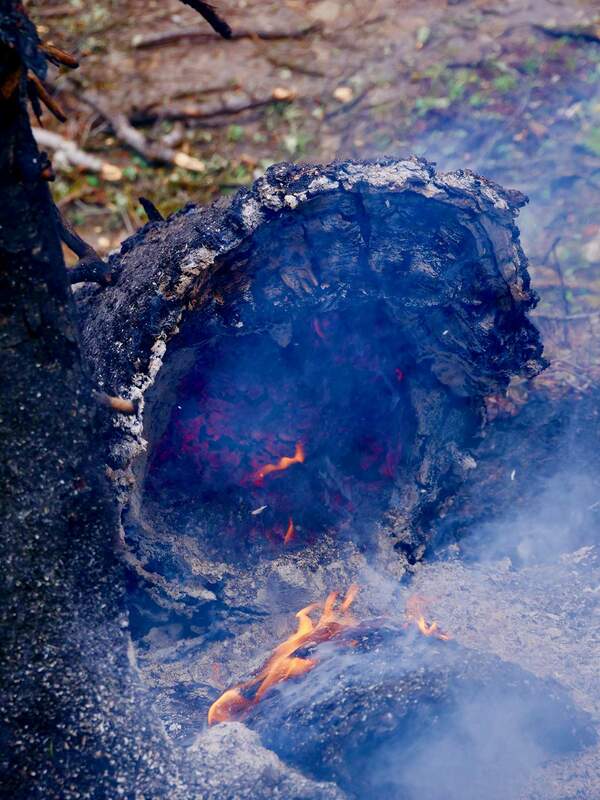 A stump burns Sunday, June 17, in the Burro fire east of Dolores. The heat map for the Burro Fire, obtained in a flight after 10 p.m. Sunday, showed no fire growth, at 3,715 acres. The flight team speculated that the isolated heat source west of the fire might be a spike camp or hot machinery. Fire behavior on the Burro and 416 fires was expected to be limited on Monday, with little or no growth, and crews were focusing on mop-up operations, and securing fire lines. Crews battling the Burro Fire took got back to work on Monday after a weekend of “wetting rain” that calmed the flames. Fire behavior on the Burro and 416 fires was expected to be limited on Monday, with little or no growth, and crews were focusing on mopping up and securing fire lines, according to the incident action plan filed Monday. 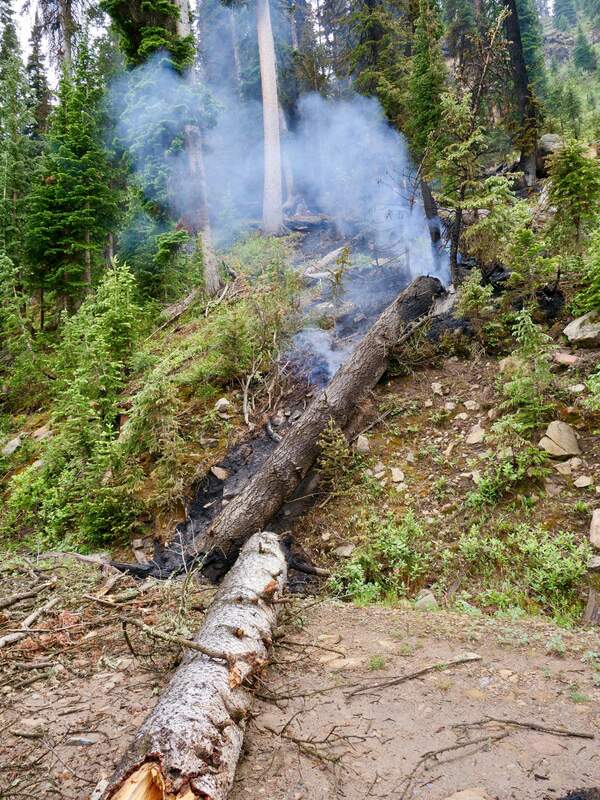 “The rain helped cool it down and lowered the radiant heat of the burning trees,” said John Bearer, public information officer for the Rocky Mountain Incident Management Team. Hand crews worked Monday on fire lines to try to contain the southern end of the fire in the Windy Gap area, north of private land. Bulldozer crews worked to clean up berms on the fire lines northwest and southwest of the fire, removing logs, slash and trees that could burn and throw embers across the line into protected areas. Mud, not flames, was the challenge of the day. A drying trend was expected to begin Monday, increase on Tuesday and continue through the week. The maximum probability of a fire igniting increased to 45 percent on Monday, compared with less than 10 percent on Sunday, the incident management team said. Areas that have been exposed to direct sunlight have the highest chance of igniting, though stumps and logs and continued to burn. On Saturday, crews benefited from .2 inch of rain, and on Sunday, about an inch. The rain, which fell hardest after midnight Saturday, continued until about 8 a.m. Sunday, was about double the “wetting rain” threshold of a half-inch for timber in a dense tree canopy. Still, incident team managers on Monday encouraged firefighters to remain vigilant, reminding them that dangerous fires have ignited during mop-up stages. 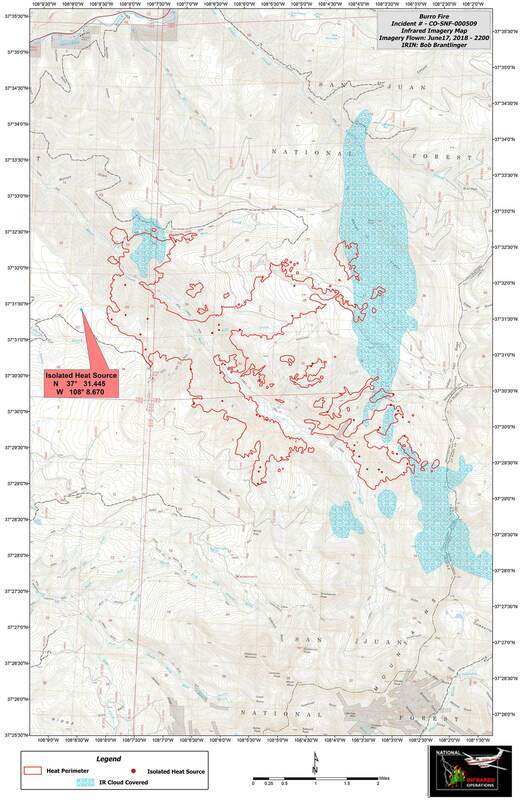 An infrared mapping flight on Sunday night showed that the size of the fire was unchanged at 3,715 acres. Containment remained at 12 percent. Andy Lyon, public information officer for the incident management team, warned that residents should not become complacent or overly optimistic; hot, dry weather is expected to return this week, bringing life to the fire. He added that he hoped residents would use the weekend’s window of opportunity to do some home mitigation work. High temperatures through Friday were expected to be in the 60s, with lows in the 40s, according to incident meteorologist Royce Fontenot. There is a chance of isolated thunderstorms on Thursday and Friday. The Haines Index, which measures the potential for dry, unstable air to contribute to wildfires, was expected to rise through the week. After Sunday’s rain, it was at 3. By comparison, it was at 6 during last week’s substantial growth. On Monday, the Haines index was at 5 for both the Burro and 416 fires. A Haines Index of 6 means there’s a high potential for an existing fire to become large or exhibit erratic fire behavior, 5 means medium potential, 4 means low potential, and anything less than 4 means very low potential. 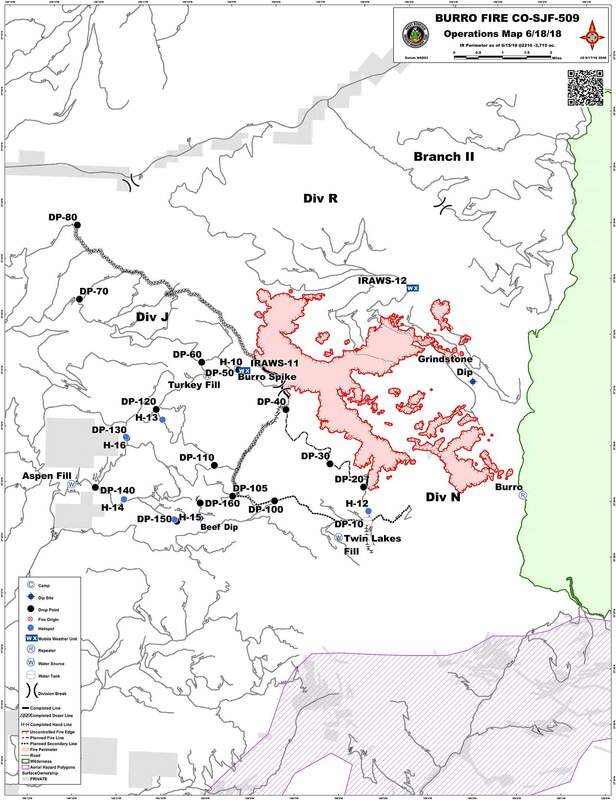 On Saturday, crews beat the overnight storm to the punch and finished bulldozing more than 6 miles of containment lines in the key northwestern and southwestern sectors of the fire. On Sunday, the bulldozed roads were muddy and difficult, and crews were “resting in place,” Lyon said. Bulldozer crews on Saturday focused on the fire’s west side to clear a line southward near the junction of Forest Road 561 and the Gold Run Trailhead. Crews also extended a bulldozer line that runs northwest roughly paralleling Forest Road 561, west of the more intense flareups near Little Bear Trail. Firefighters on Sunday prepared for their next steps. Tree fellers, skidders and chippers were assigned to reinforce fire lines and remove flammable fuels along the completed bulldozer line in the northeast sector of the fire. They also got a break. “They are doing what firefighters do, sharpening their saws, cleaning up gear and enjoying the break,” said Lyon. With the bulldozed lines complete, firefighters will next clean up fire lines and berms of downed timber and other fuels that could jeopardize the lines if the fire reached them, Lyon said. Then, as conditions improve, crews would ignite back-burns to further secure the line and attain containment for the area.